Entertain outdoors easily and elegantly with Strathwood's folding Ritta bistro set. Including a 28-inch-tall table with 24-inch-diameter and two chairs measuring 23 inches wide by 18 inches deep by 35 inches tall, the collection is easy to set up, take down, and transport. The table weighs 3.82 pounds, and each chair weighs 4.64 pounds. Durable aluminum frames have a curvy elegance and dark gray powder coating versatile enough to co-exist with any decor and sturdy enough to withstand the elements. Seat and table surfaces feature polyethylene (PE) rattan wicker, a synthetic fiber celebrated for withstanding fading, weathering, and aging as well as for being easy to wipe clean with mild soap and water. 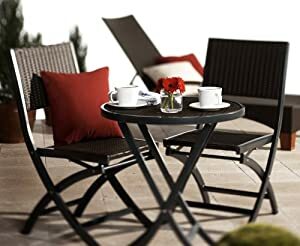 The elegant and handy little bistro set helps turn any deck or patio into a mini oasis.